The TSMP series is an advanced, re-designed multistage pump that has a proven operating history, a worldwide installed base, and is being used in many growing, changing, complex markets. 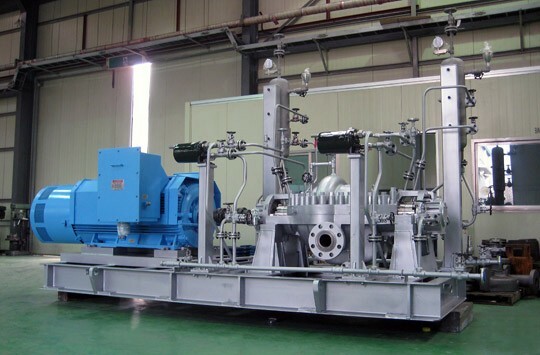 The TSMP is a axially split BB3 pump with enhanced features that makes it an extremely reliable, high performance pump well suited to a wide range of services in oil and gas production, refining, pipeline, power generation, and the mining industries. The TSMP features all of the latest required API requirement per the 610 10th edition publication which includes bigger shaft for less shaft deflection, larger sealing chamber to fit a wide range of single, double, and tandem cartridge mechanical seals. The impellers are dynamically balanced to meet API 610 requirements. With a complete line of pumps the TSMP family ranges from sizes of 3x2-7 up to 10x8-13 and most are available from 2 stage up to 16 stages. Our pumps can handle flows from 100gpm up to 3000gpm and heads up to 2500 PSI. We also manufacture in a wide of variety materials per API guidelines.